Hoping to revitalize downtown Milwaukee, the Metropolitan Milwaukee Association of Commerce spearheaded the drive in the 1990s to replace the outdated convention hall of the MILWAUKEE EXPOSITION CONVENTION CENTER AND ARENA with a larger meeting space. A team of six firms eventually developed the 189,000 square foot Flemish and German-inspired Midwest Express Center, which opened in 1998. The state’s Wisconsin Center District financed the structure’s cost of more than $170,000,000 using tax revenues levied on hotel rooms, rental cars, and food and beverage sales. The facility took its original name from the Wisconsin airline, Midwest Express, and was renamed as the airline industry restructured. 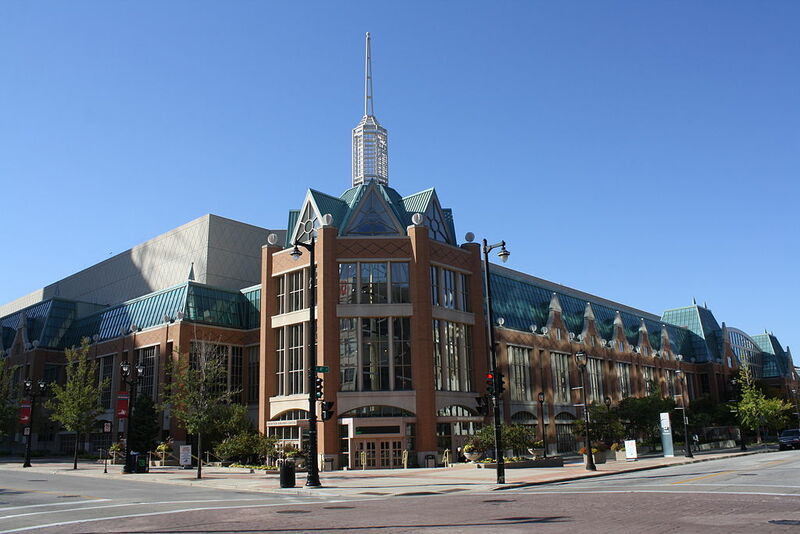 The Wisconsin Center attracts mid- to large-sized conferences and trade shows and competes for business with convention venues across the Midwest. ^ Mike Nichols, “Convention Hall Named Midwest Express Center,” The Milwaukee Journal Sentinel, February 20, 1997, 1; Rick Romell and Todd Daykin, “Milwaukee’s New Crown Jewel,” The Milwaukee Sentinel, July 19, 1998, 1. Activists protested the lack of African American and female contract laborers employed during construction in 1998. Jack Norman, “Wisconsin Center Becoming Focus for Protesters,” The Milwaukee Journal Sentinel, June 3, 1996, 3B. ^ “The Cream City Associates team” consisted of Bethesda, Maryland’s George Hyman Construction Co.; Brookfield, Wisconsin’s Hunzinger Construction Co.; Milwaukee’s Engberg Anderson Inc.; Atlanta, Georgia’s Thompson, Ventulett, Stainmack & Associates Inc.; Madison, Wisconsin’s Affiliated Engineers Inc.; and Milwaukee’s Graef, Anhalt, Schloemer & Associates Inc.; Crocker Stephenson, “Contractors Plan to Gain Prestige, If Not Profits,” The Milwaukee Journal Sentinel, February 14, 1996, 4. ^ The Wisconsin Center District also operates the Milwaukee Theatre and the UW-Milwaukee Panther Arena. Don Walker, “Delta Airlines Naming Deal to End at Milwaukee Convention Center,” The Milwaukee Journal Sentinel, May 1, 2013; Tom Daykin, “Meeting the Future,” The Milwaukee Journal Sentinel, October 26, 2006; Whitney Gould, “Milwaukee’s Center of Attention,” The Milwaukee Journal Sentinel, July 19, 1998, 10.